An artistic, smart self-help book that prompts and inspires readers to write lists of things they like–a simple yet profound way to collect and remember the good in daily life. With that in mind, it’s fair to say that Suskin doesn’t inspire any immediate or actual list writing in Go Ahead & Like It. At best, she suggests that it would be a nice thing to do – “and here are some of my own, as a nice example.” The book is marketed as a guide as a way to appreciate the world via list making. In reality, it is a book about how Suskin views the world, using lists as an illustration. The difference is minor in theory but significant in application. Any invitation for the reader to join in is only rhetorical because there are no lined pages or blank numbers where readers can join in the fun. So with one gaping hole in intent/execution aside, I’ll say that this was an enjoyable book. I went and found an old notebook and worked on a few of Suskin’s suggestions, which are quirky and entertaining when they’re about me (rather than Suskin’s own inventions). For example, the author invites us to write a list about what we can enjoy in a nasty situation, like being stuck in standstill traffic after a long day of work. Go Ahead & Like It is filled with these kinds of invitations to make lists, particularly lists of “likes.” The pages are filled with scrapbook-like illustrations of Suskin’s own “like lists.” As the text progresses, Suskin moves from simple “like-lists” to introspection – “WHY do I like what I like?” – and eventually to an invitation to be active and consistent in identifying simple, delightful things around us. When we list the things that we like, on our highway drive, on our walk to the store, in any moment, we are polishing our understanding of how life continues to captivate us. Let your lists be reminders of enchantment, implements of reverie, loving missives, or healing advisors. In reality, this book really isn’t about lists at all, although that’s how it’s billed. 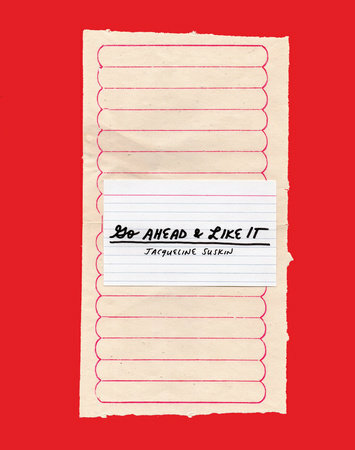 Go Ahead & Like It is a personal manifesto on one way to appreciate the minutiae of life. Little joys like old suitcases, cool pillows, and bull kelp are the everyday things that fill small moments and keep us going. If Go Ahead & Like It is an invitation to be a bit more purposeful about noticing those things, it is a success. If, instead, it is “self-help book that prompts and inspires readers to write lists of things they like,” it is something of a failure. After reading it, I’m neither prompted nor particularly inspired to write lists. I am, however, a bit more conscious of noticing and marking the small things that delight me. So that’s good. This book was provided for review by Penguin – Random House.